In December 2013, Michael Burke (aka “Big Mike” and/or “Burkie”) was diagnosed with brain cancer at the age of 58. During the following 15+ months, Big Mike fought every day with a smile on his face, however he unfortunately lost his battle just days after his 60th birthday. Burkie was a great husband, father, grandfather, brother, uncle and especially a friend to all who he encountered and will always be a powerful example to us all on how to treat people. Our hopes are to continue Big Mike’s legacy and to keep his memory alive. We’d like to invite everyone to join us for our annual walk and pig roast in honor of Big Mike. The past two years, Mike’s wife, Lee, has pulled together a great group to participate in the Boston Brain Cancer Walk, followed by a pig roast at the Boston Harbor Yacht Club. A lot of money was raised and contributed to the National Brain Tumor Society, and we were able to collect even more money to help out some families in need. Unfortunately, the truth is that our circle will always know someone who needs help while battling cancer. 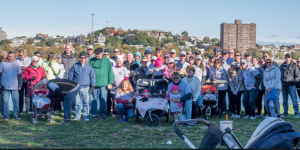 This year, instead of participating in the Boston Brain Cancer Walk, we will be leading our own walk – “Burkie’s Walk” – around the Sugarbowl and back to the BHYC for a pig roast on October 15th. The Michael Burke Foundation was founded this summer with the goal of benefitting cancer patients and their families as they struggle with the many challenges, medical and otherwise, that come with this disease. This fall’s “Burkie’s Walk” and pig roast will serve that end, especially for the family of Alex Moore. Alex is the niece of Bobby Keogh, one of Big Mike’s best friends, and she was diagnosed with Stage 2 Breast Cancer in June of this year at age 29. Having lost her mother to cancer in college, Alex and the entire Keogh family know especially well how devastating cancer can be medically, emotionally and financially. Alex is a wife and mother of two young children and remains determined to fight and defeat this cancer. The Michael Burke Foundation wants to help reduce any financial burdens Alex may have so that she can focus all of her energy on her fight. So please come join us for “Burkie’s Walk” and pig roast on October 15th for a great time to help Alex and others when they need it the most. Start time: October 15, 2017 at 10:30 a.m.
Football: Pats v. Jets at 1 p.m.